 Macomb County is excited to announce the Tree, Shrub and Plant Sale, a collaboration between Green Macomb and the Blue Water Conservation District. The spring sale provides an opportunity for the public to purchase young trees, fruit trees, flowering shrubs, wildflower seed and other fruits and vegetables at the most reasonable prices you can find. Some items available at the sale are fruit, oak, maple, lilac, redwood, and dogwood bushes/trees. In addition to strawberry, raspberry, asparagus, horseradish and rhubarb. Prices range from $5 to $20. While supplies last. Pre-orders are being accepted from Feb. 1 through April 4. Pick up your pre-ordered plants at Dodge Park in Sterling Heights. Friday, April 26 from 10 a.m. to 7 p.m. and Saturday, April 27 from 9 a.m. to 1 p.m.
New this year! Place and pay for your order online. Or, download the order form to fill out and mail in with your check. Additional stock will be available for day of purchases - Limited availability - while supplies last. MSU Extension and Blue Water Conservation District representatives will be on hand to answer questions and provide planting guidance and tree care advice. Warranty Disclaimer: Trees/Plants are primarily sold as Bare Root Stock. District liability ceases when orders are picked up. Seller is not liable for improper handling or planting of plants after consumer has possession. The Blue Water CD is not liable nor guarantees survivability. Additional information about the Blue Water Conservation District tree sale can be found here. The trees and shrubs available through this sale are bare-root, which means they will not come with any soil. Using bare-root stock is a great way to reduce costs and more quickly establish planted trees and shrubs, but it is very important for long-term success that they are properly planted and cared for. Bare-root stock should be planted as soon as possible. Prior to planting, they should be kept cool (but not frozen) and out of the sun, and never let the roots dry out. 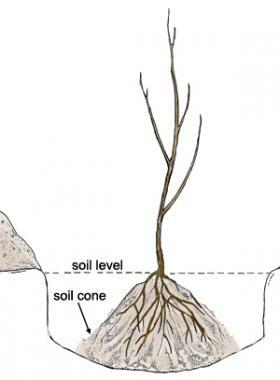 The Arbor Day Foundation has guidance on how to plant bare-root trees, as do many other landscape and gardening companies. 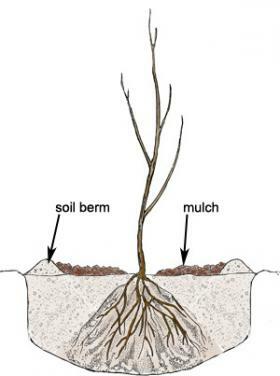 The Gardener’s Supply Company in particular has a great description of how to plant bare-root trees and shrubs. Like all trees, newly planted trees are susceptible to accidental damage, so avoid using weed whackers and lawn mowers within a few feet of any landscape tree.